Suddenly, this word is being nudged into our consciousness and we’ve forgotten what it’s all about. What, honestly and truly, is nationalism? Okay, the easy answer. It’s love of country. It’s a return to the values of yesteryear when the notion of nation drew us close together, particularly the war years. Fear and loathing of the Japanese invader and occupant. The tramp of his hobnailed boot, the terrors of Fort Santiago. Bataan and Corregidor. The Death March. Filipinos dying by the multitudes. The sword of Dai Nippon plunged ruthlessly into their entrails.That is the only time I personally remember, outside of the Philippine revolution against Spain and the insurgency against the United States, that many Filipinos were ready and willing to die for this entity called Bayan kong Pilipinas. The Filipino nation. Pilipinas kong mahal. Hundreds of thousands did perish if not a couple of millions. Then and only then did love of country surge into the Filipino soul like molten lava. La patria was the revered fatherland. And a brace of Filipino heroes at the end of the 19th century gave their lives – willingly, courageously, indomitably.Then the patriotic songs – Bayang Magiliw, Bayan Ko, Pilipinas Kong Mahal.Today? The songs still rouse us, sometimes. The memories still rouse us, sometimes. The myth of nationalism and nationhood still rouse us, sometimes. But even when it was supposed to resurge like a great redeeming flood, and set out hearts pounding like trip hammers – like EDSA I and EDSA II – it just wasn’t there anymore. When we toppled the dictator Ferdinand Marcos and the pretender Joseph Estrada, it was not because of nationalism. We swept these two dastards out of power because we hated their guts. We didn’t bring out the flags. We pealed no nationalistic bells. There was no notion of nation streaking to the heights like star shells.We look at our leaders, our politicians. We don’t see nationalism writ on their faces. What we see is pork barrel. What we see is the pigoty. What we see is power hoisted to the pedestal of Bacchus, Mars and the tinkle-twinkle thunder of a Thor turned traitor. And so we must explain what nationalism is about all over again. We must go back to its beginnings, pull out its roots, and tell our countrymen to gather at campfires all over the country. So we can recharge as Filipinos, recharge as a nation. The battles we will have to fight right ahead will need the torches of nationalism to light the way. We had rainbows at both EDSAS, but they had no nationalistic booster rockets. And so we lost our way again. With nationalism both as a guiding flare and ideological rocket, the fights ahead will be daunting. But God willing, we shall overcome. So we start with the basics. Hang on. This will take some time.It’s a strange, macabre twist of our history that the first deadly lance flung to defend – that is the perception – our archipelago from foreign invasion as that of Lapu-Lapu into the heart of the Spanish conquistador Ferdinand Magellan. At the time, the archipelago was not a nation. It was a sun-drenched splinter of thousands of islands. What they had in common was a tribal culture, hundreds if not thousands of independent fiefdoms engaged in all kinds of trade, primitive agriculture, fishery, handicraft, and widespread piracy.Strange again, and macabre again. Magellan’s conquest of the Philippines, coupled with the advent of the Roman Catholic cross, eventually transformed, through colonization, this archipelago into a nation. The sword and the cross made sure the archipelago came into the imperial possession of Spain, named Las Islas Filipinas after King Philip. A nation we may have been through imperial decree. But Filipinos we were not. We became Filipinos only through colonial exploitation. We became Filipinos because we learned to protest, to resist and to fight, to band together in fear and in hate of the brutal conqueror. We became Filipinos because the few learned among us, Jose Rizal, Andres Bonifacio, Apolinario Mabini, Emilio Aguinaldo, the Luna brothers et al, gave flesh and bone to the word Indio. We became Filipinos because we created La Liga Filipina, the Katipunan and waged the revolution against Spain. We became Filipinos because we fashioned our own national flag, splattered it with Indio blood. We earned through our heroism the admiration of our colonized peers in Asia. We proclaimed the first republic in the continent. We showed everybody what patriotism was. What courage was. Thus was a nation born. Thus was nationalism born. 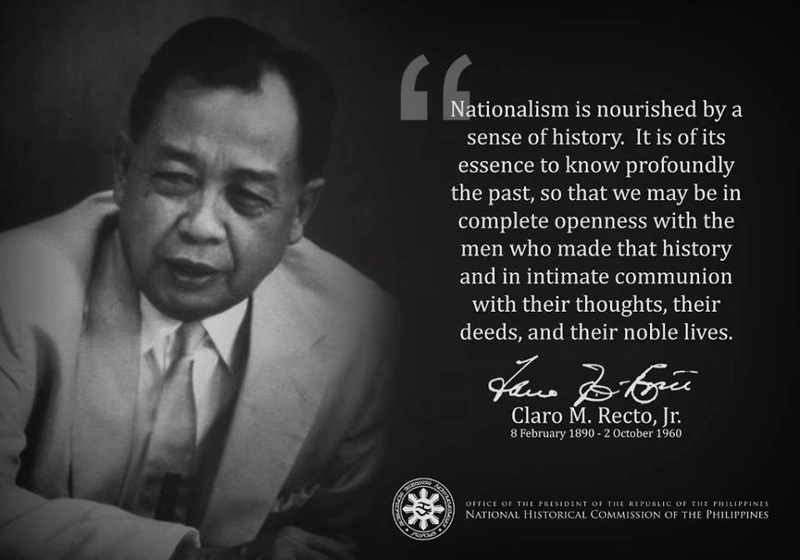 But we have to go far back in history to get the kind of grip we Filipinos need on this modern phenomenon of nation and nationalism. Long before, after Anno Domini set in, there was the universal church in the West. The Roman Catholic Church had absolute dominion. Obeisance to the Pope and the Vatican was writ on every Western tablet. Then the dynasties came. There were the Normans, the Pantagenets, the Stuarts and the Tudors in England. There was the Romanov dynasty in Russia, the Hohenzollerns in Germany, the Bourbons in France, the House of Savoy in Italy.As they spread through conquest and accumulation of riches and property, the dynasties started to weaken the hold of the universal Church. Out of these dynasties emerged the kingdoms, the monarchical states. As these states became more centralized, more powerful and extensive, the bedrock of the nation started to come into being. The Treaty of Westphalia in 1648, after the 80 Years War and the 30 Years War, recognized the territorial sovereignty of the states. Thus the nation-state was born. Thus began the meltdown of empires. Thus began, as the great Arab historian Ibn Khaldun said, "The mutual affection and willingness of a people to fight and die for each other." Listen to this. Nationalism was generally expressed by the leaders, the intellectual elite, the writers, the professionals, the middle class, the studentry and the youth. Only much later on did the masses get into the picture with not too much emotion. It was in France and England where nationalism initially took deep and unshakeable root. This was the France which shook the world with its "liberte, egalite, fraternite" revolution of 1789. This was the England where Oliver Cromwell held kings by their pantaloons and drove the fear of God into their thrones. The best definition of nation was articulated by Ernest Renan of the Sorbonne in 1882: "A nation is a soul, a spiritual principle, two things which are in reality...one. One is the common heritage of a people of a rich heritage of memories; the other is the actual agreement, the desire to live together, the will to continue to make a reality of the heritage they have received in common." Now take heed. It was only in the 20th century when the principles of nation and nationalism reached Asia. And upon reaching Asia, (whose colonial chains were then being broken) spread into so many explosions of nation-consciousness. This was certainly a reaction against the abuses and excesses of Western colonialism, as it was a reiteration of Asia’s earlier glory as the origin of the world’s great religions and great civilizations.Unlike the Philippines, much of Asia could look back thousands of years and hoist the glitter of a myriad cultures, a myriad achievements in war and literature, philosophy and industry, architecture and the arts, science and technology. This also probably explains why many countries in Asia – again not the Philippines – took to nationalism like long-concealed thunderbolts of energy to make up for lost time. To survive, to make themselves again proud in and of their new nationhood, they had to study, learn and master the science and technology of the West.That was the only way they could subjugate poverty. Restore dignity to their peoples. The journey of a thousand miles starts with the first step. That first step bolted like a screaming bullet out of the starting block. They have been sprinting like mad ever since. We Filipinos remain stuck in a stupor and lethargy we must annihilate. We move or we die. We embrace the flag, and swift like a stampede across the vast plains of nationalism or we die. We were born Filipinos. Now we must learn to be Filipinos. We must immerse ourselves into a changed and dynamic culture. For culture is never permanently fixed, never frozen. Like the Japanese, like the Koreans, like the Malaysians, we must care, we must hustle, we must be proud. we must learn. We must work hard. Science and technology were never the monopoly of anybody, any nation, any civilization. We have to grab them.The permanent care-givers of the world we are not. Neither are we the muchachos and the muchachas, the utos and the utusans. And certainly, we are not the yukis of Asia – Japayukis, or Chekwayukis or whatnot. The Filipino can? Yes, the Filipino can. If he wakes up and embraces the noblest sentiment of them all – nationalism. It is amazing what brilliant minds our 19th century heros had condidering the conditions, communications and publications then. I would propose however that the concept of nations date back further as evidenced by the Republic of Plato, the biblical accounts of nations and other ancient historical records. The fact that people were at odds and have gone to war as "nations against nations" went beyond mere allegiance to a King or leader. It spoke of collective love for an entity that transcended the ruler. To look at modern man in the modern setting however where people travel and migrate, communication is global, and humanity values and aspirations are not limited by color, creed or age; defining "nationalism" becomes a real challenge. Careful examination of a specific person however, would reveal that his identity as a citizen of a country roots from his memories or recollection of his youth and upbringing. "I am a Filipino", is not just defined by where I was born, but moreso by my experiences and environment as I grew up. I can truly grasp the concept of loving the Philippines. My children who grew up in the US, regardless of where they were born, has the same exact sentiment for the US. Any feeling for the Philippines in them is a result of their empathy for how we, their parents, feel about our country, and perhaps their heritage as a Filipino in interacting with other Filipinos in their age group. Love of country requires a positive experience about the country that is integrated in the person's total being. Like any affective emotion, it needs nurturing. Neglected and abandoned, it will wither and die like a priced orchid.